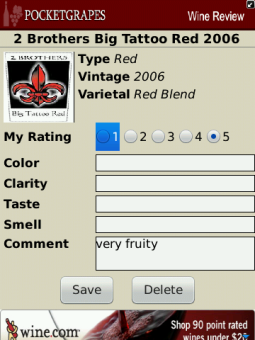 PocketGrapes Digital Wine Diary FREE By Cassetica Software Inc. Write a review RELEASE 3 of undoubtedly the best Digital Wine Diary available! 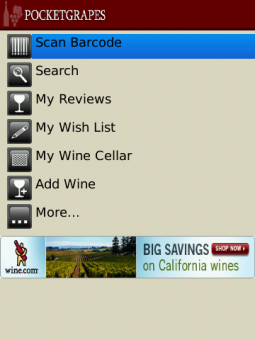 With over 75,000 wines in our database, building and maintaining your own personalized diary has never been easier. You can search our catalog, which will provide a detailed wine description, including vintage, professional ratings and more. Then, create your own review, add it to your Wish List, or to your Cellar! You even have the option to access your Diary online from any computer using our website. That's not all, use PocketGrapes to: -Record personalized user comments to help you keep track of your preferences. -Access all information on http://www.pocketgrapes.com. 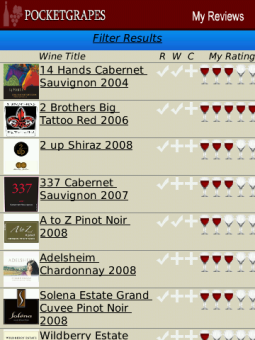 So, you can access your wine diary from your computer or your phone. 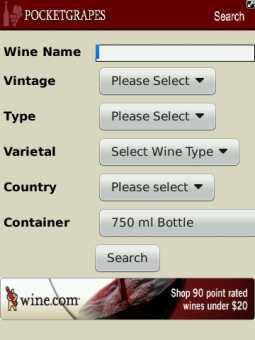 -Capture Wine Labels for any wines that you add. 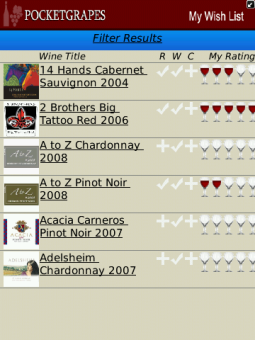 -Update your Facebook or Twitter status from the Wine Detail or Wine Review pages. Notes- -The application supports Barcode scanning, however the barcode library is not very robust. So, we recommend you use it for just tagging your own wines. -This is a Wine Diary, not a Catalog so do not expect every wine to come up. Download this BlackBerry® Super App regional winner today! http://www.blackberrypartnersfund.com/regionalwinners Please email us, if you find any issues and we will work ourt best to resolve your problem.